A Bob Woodward expose book has been a rite of passage for presidential administrations since the storied investigative reporter first made a name for himself by breaking Richard Nixon's Watergate scandal. Now it's Donald Trump's turn under the microscope. Donald Trump's supporters will say, not without cause, that Woodward epitomises the Washington establishment their man is fighting against. It's also true, however, that the reporter has unrivalled access to the corridors of power, and the general Washington consensus is that it's better to talk to him than not, since your colleagues - and enemies - are certainly giving him their side of the story. While the accounts in Fear: Trump in the White House are provided on "deep background" - i.e. without attribution - the episodes Woodward recounts and the quotes he uses come from those in the room - and often, in fact, from the people who were doing the speaking. The White House, and the president himself, have since responded to the book, calling it "fabricated stories" by "former disgruntled employees". "It's just another bad book," Mr Trump told the Daily Caller during an interview, adding that Woodward "has a a lot of credibility problems". 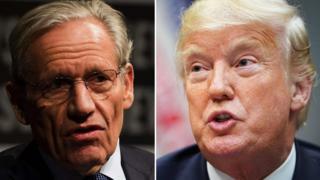 Woodward describes several instances where Trump administration officials - chief economic adviser Gary Cohn and White House Staff Secretary Rob Porter, in particular - removed documents from the president's desk to keep Mr Trump from signing them. It was all part of a larger effort to insulate the administration, and the nation, from what they saw as Mr Trump's more dangerous impulses. Documents that would have allowed the president to withdraw the nation from the North American Free Trade Agreement and a trade deal with South Korea were hidden - and the US has since committed to renegotiating the pacts. On 27 January, according to Woodward, the president's personal attorney John Dowd staged a mock interview session with the president to demonstrate what he feared would be the disastrous results if Mr Trump were to sit down with Robert Mueller's special counsel team investigating possible ties between the Trump campaign and Russia. It didn't go well, as the president grew increasingly frustrated with the intensity of the questioning, at one point angrily calling the investigation "a goddamn hoax". Dowd would go on to meet Mr Mueller and reportedly tell him that he couldn't agree to the interview because he didn't want to let the president "look like an idiot" and embarrass the nation on the world stage. When it later appeared that the president had changed his mind and was going to testify after all, Mr Dowd resigned. One of the sources of considerable consternation for the president's staff, per Woodward, was what they viewed as his dangerous impulses on foreign policy. After the US believed the Syrian government had launched another chemical attack in April 2017, Mr Trump told Defence Secretary James Mattis to assassinate President Bashar Assad. "Let's kill the [expletive] lot of them," the president reportedly said. Mr Mattis acknowledged Mr Trump's request then, after the conversation, told an aide he wouldn't do "any of that". Woodward says administration officials were also concerned when the president asked for plans for a pre-emptive military strike on North Korea during the height of his feud with Kim Jong-un. The president also dressed down top generals over their handling of the war in Afghanistan, saying that soldiers "on the ground" could do a better job. "How many more deaths?" he asked. "How many more lost limbs? How much longer are we going to be there?" Woodward paints a picture of a White House staff constantly beaten down and belittled by a temperamental president. When White House economic adviser Cohn tried to resign after the president offered sympathetic comments about white nationalists who engaged in a violent August 2017 rally in Charlottesville, Mr Trump accused him of "treason". Cohn, according to Woodward, views the president as a "professional liar". Mr Trump also told Commerce Secretary Wilbur Ross he didn't trust him. "I don't want you doing any more negotiations," the president reportedly said. "You're past your prime." He compared his first chief of staff, Reince Priebus, to a rat. "He just scurries around." As for Attorney General Jeff Sessions, who the president has publicly berated, privately he was even more disparaging. "This guy is mentally retarded," Mr Trump reportedly told staff secretary Porter. "He's this dumb Southerner. He couldn't even be a one-person country lawyer down in Alabama". If the president was abusive toward his staff, it appears they have got some measure of revenge in the Woodward book, which is chock full of caustic quotes about the president attributed to the aides and advisers who serve him. Chief of Staff Kelly repeatedly calls Mr Trump an "idiot" and said that "it's pointless to try to convince him of anything". Defence Secretary Mattis told an aide that the president has the foreign policy understanding of a "fifth- or sixth-grader" (an 11 or 12-year-old). Mr Trump's relationship with Rex Tillerson reportedly never recovered after news accounts that the former secretary of state once called the president "a [expletive] moron". If that's the case, Woodward's book could cause serious damage within the White House in the coming days. In a pre-emptive strike against what is sure to be a furious White House pushback against the book, the Washington Post released an audio recording and transcript of a call the president made to Woodward in early August. In it, the president claims he was never contacted for an interview or informed of Woodward's soon-to-be-published work - an assertion the reporter successfully rebuts. Mr Trump makes several attempts to steer conversation toward his foreign policy achievements and economic record as president. "Nobody's ever done a better job than I'm doing as president," he says. "That I can tell you." Woodward says through his interviews he "gained a lot of insight and documentation" - and that his book would be a "tough look at the world and your administration and you." "I assume that means it's going to be a negative book," the president replies. Woodward concludes the call by saying "I believe in our country, and because you're our president, I wish you good luck". If his book is any indication, Woodward probably thinks Mr Trump will need all the luck he can get.